On June 9, 2015, the OECD marked the end of a seven year experimental testing programme, investigating 11 commercially viable nanomaterials across over 110 different chemical tests. And revealed the long awaited release of information on the accuracy of tests used to determine their safety. 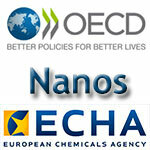 In its press release, OECD reminds us that with manufactured nanomaterials becoming more and more a part of everyday life, the pressure on governments to consider the risks posed by such tiny particles on human health and the environment has been mounting. Manufactured nanomaterials are used for a variety of applications from sunscreens and cosmetics to paints and pharmaceuticals. With the explosion of applications for nanomaterials, the problem for governments has been in ensuring that consumers have confidence that the tests used on standard chemical compounds are adequate for these new and dynamic materials. The results of this seven year programme were co-ordinated from across 11 countries with tests and data generated from dozens of government agencies, universities, research institutions and businesses. Over 780 studies on the specific properties of nanomaterials were undertaken to fill in the gaps of our understanding of nanomaterials.